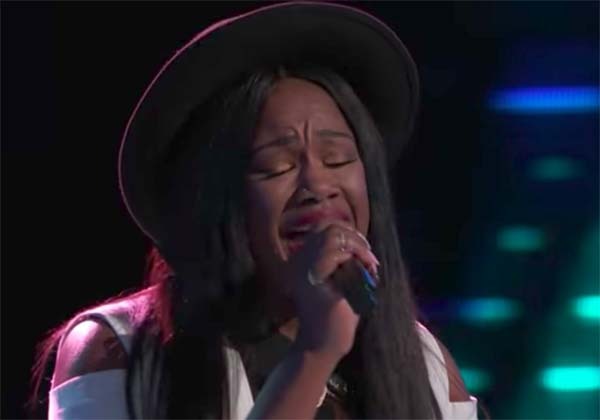 Keisha Renee sings “I Can’t Stop Loving You” on The Voice Blind Auditions premiere episode on Tuesday, September 26, 2017. “I want to break the mode of people think what country artists look like,” Renee said before her performance. Here’s what the judges have to say about her audition. “Your song choice I can guarantee that you can do something different. The key to be the best of your self is to not fit in,” said Adam Levine. “You create your own lane and I wanna help with what you want to do,” said Jenifer Hudson. “I love your song choice and I know you wanna be unique,” said Miley Cyrus. Keisha Renee joins Team Blake. Watch her performance on the video below. The Voice returns with Adam Levine, Blake Shelton, Miley Cyrus and Jennifer Hudson as judges; Carson Daly as host. The Voice premieres Monday, September 25 at 8/7c on NBC.